Area:Land 18,272 km². Exclusive economic zone 1,290,000 km². Terrain: Mostly mountainous of volcanic origin. Climate: Tropical with temperatures ranging from 18°C to 23°C. Pronounced wet and dry zones on the two main islands. The wet season is from November to April and the dry season is March to October. Rainfall 1500 mm up to 6000 mm at higher elevations. Sea surface. Geography: Includes 332 islands of which approximately 110 are inhabited. Two main islands of Viti Levu and Vanua Levu with more than 300 smaller islands. Capital is on Viti Levu. Economy: Important industries include sugar and tourism. Fish, sugar, garments, gold and timber dominate export commodities. Fresh water aquaculture in 1954,Tilapia ( mossambicus) was introduced into ponds in Nacocolevu Agriculture research station to support diets for pigs. Escaped into the wild a nd inundated the adjacent river systems and from there spread to other major river & water systems. Although it became an important source of animal protein for those living beside those water systems, its early maturity and breeding habits caused it to become a pest to other culture species latter. 1971 Raviravi, Ba (Western Viti Levu), a newly reclaimed mangrove land of about 100 acres (38.7Ha) in area was provided to try out aquaculture for the culturability of several brackish species including signaids, milk fish, mullets and prawns/ shrimp. This was facilitated by FAO. It provided technical expertise and funds. Tilapia mossambicuss that has inundated the surrounding water usually enter the pond when ponds were filled. The fish was noted that it tolerated the new pond conditions or the pond environment. 1973/4 the niloticus was introduced from Israel to be tried out in the ponds at Raviravi. Although the niloticus was found to be a better cultured spp than the mossambicuss, the two species inter breed easily and the hybrids dominated the water system. The remaining stock of niloticus were transferred to Lami than to Naduruloulou aquaculture station in 1980/82 but it was difficult to maintain the strain as the surrounding waterways were full of the other spp 1982. The US Peace corps with Government used for the Rural Aquaculture programme. This was with the purpose to establish fish farms in inland areas. 1988 the Chitralada strain of niloticus from the castle ground was introduced from Thailand. This again di not take long to mix with the other two former spp. 1998 the GIFT tilapia, a genetically improved strain of tilapia was introduced and this has brought a different dimension to tilapia culture in the Fiji Islands. Carps : 1975 was introduced from India and kept in the ponds at Lami. It was introduced for the control of water weeds that have infested the river systems in the main islands of Viti Levu and Vanua Levu. Unfortunately, the fish cannot breed in captivity and the river systems in Fiji are too short for the fish to successfully breed as it takes 18 - 24 hours for the eggs to hatch out. 1976. The Naduruloulou Government Freshwater station was established and the carps and tilapia from Lami were transferred there. There were other introductions from Thailand, Korea, China etc. The breeding stock was been built up and the fingerlings were released into the Rewa river,the major river. 1984 - 1989 JICA assisted with a project for Research and development of aquaculture and included the attempt to successfully breed grass carps in Fiji. The silver and big head carps were introduced in the period for more carp spp. to use for fish farming. Over the project period several introductions were made from Japan and accidentally introduced the garden snail that have become a pest in the ponds. The carp was successfully spawned in this project period. Spawning of the carps at the Naduruloulou station has been a success since then and been produced on demand. Most water bodies are cleared of weeds. Black Bass was introduced from New Caledonia in 1984/1985 for stocking in a newly Vaturu reservoir right in the hills of Nadi or Fiji international airport. Ornamental fishes (gold fish, koi carps, sartoga) There have been introductions of the ornamental fishes from the colonial era for home aquariums by hobbyists. In 1993 - 1994 the Ministry of Agriculture, Fisheries & Forest considered ways to centralize the importations for control on possible introduction of diseases etc. Three importers only were allowed to bring in their stocks for breeding and distribution in the country. The companies were active at the beginning but have quietened down and this lead to the Department to introduce some stocks to Naduruloulou from a local farm and from Malaysia in 2002 breeding and to supply to the public. The Department has demonstrated that ornamental fishes has a good market and is hoping that a private entrepreneur will contuniue. Brackish water aquaculture Prawns - P. monodon - Occurs locally and the attempt to culture began with trials at Raviravi with assistance of FAO (1973 - 1978). From 1982 attempt to commercially culture the spp at the farm began with the first hatchery established. In 1982, the Raviravi farm was turned into a first commercial shrimp farm in Fiji The owners were Fiji Government and Aquacop from France. After some difficulties to commercially produce PLs of P. monodon, P. stylirostris was introduced in 1984. In 1990, an Australian group took over and wanted only to work with P. monodon. In 1991, the management at Raviravi assisted another farmer by establishing the second commercial farm in his land in Navua on the Eastern side of Viti Levu (main island). 1998. The Department of Fisheries established a hatchery in Navua area as 4 commercial farms were established around there. The cultured spp was monodon and with out any success, the spp changed to stylorostris in 2006. The results to date on production of PLs using this new spp has been encouraging. A batch of P.japonicus was introduced in September and been successfully spawned at the hatchery too. A partnership company would take over to commercially operate the hatchery from November 2006. Milk fish. After over two decades that the culture of milk fish was tested in Raviravi, government considered the farming of milk fish in 1998 for various markets and foremost was for baits in the tuna industry. It was established that around 80% of fish frys in the coasts (inter-tidal area) of the two main islands were milkfish. 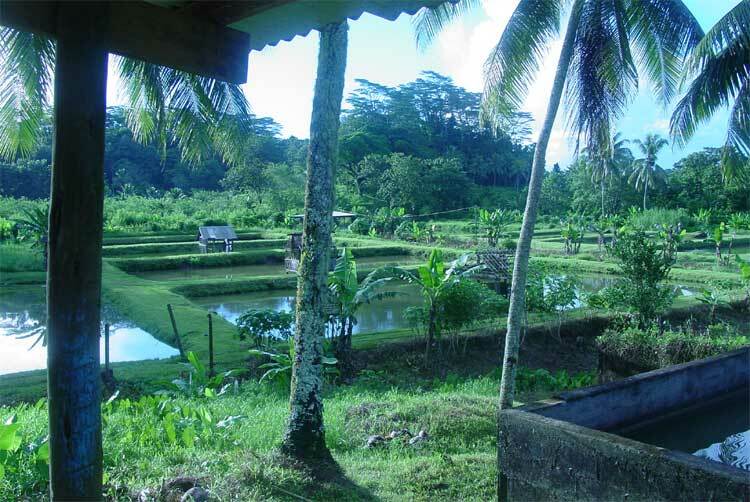 A 50 acre (20ha) farm was established on Vanua Levu, the second largest island. The farm suffered during the political crisis in2000 . In the 1970s a marine research station was established on Makogai Island, in the Lomaiviti Group. Kappaphycus seaweed 1982. Was introduced by Coastal biological, a NZ based company. After a promising start, the culture of this seaweed faced lots of problems and ceased by 1987. In 1998, Fiji through the government picked up the farming of this seaweed and although had been adversely affected by the political events of 2000, it continued and is currently being encouraged by government. 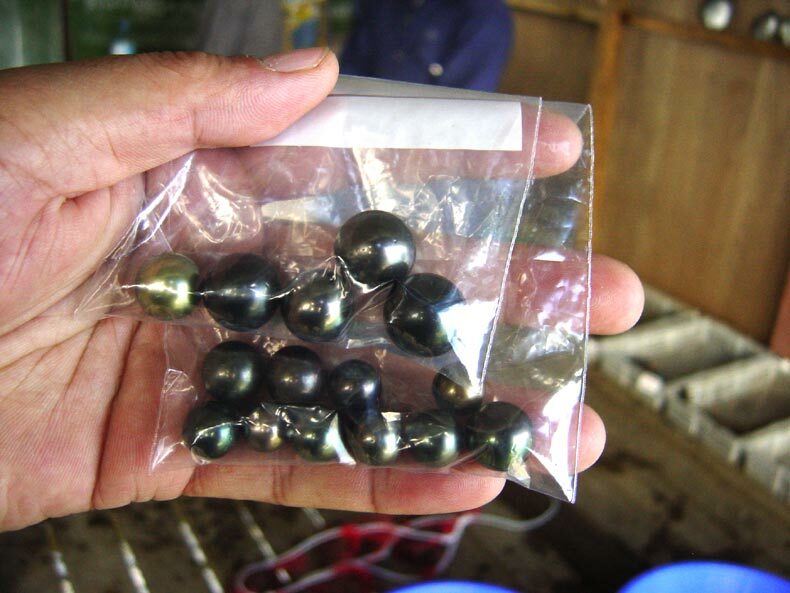 Black Pearl culture was introduced by a Japanese operator after the second world war (early 50s). it was only in 1998 that government took it up and a number of private operators have also taken it on. 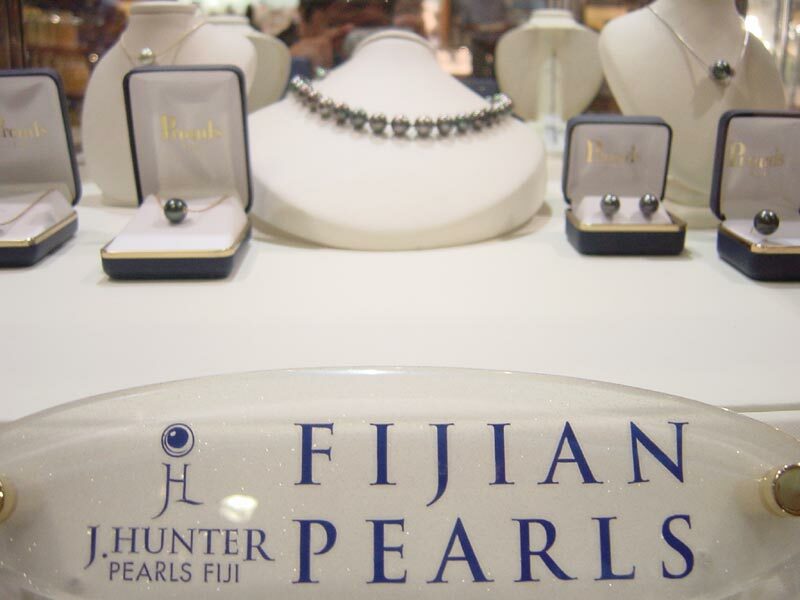 Marketing efforts for Fiji pearl was done n 2005 to Japan and one of the private company has progressed on in their endeavour to successfully run pearl farms in Fiji. Trochus spawning was done with the giant clams as the facilities were suitable for both spp. The trochus shell are marketed as is or as button blanks overseas. In the 1970s the a freshwater aquaculture station was established at Naduruloulou on the banks of the Rewa River and a marine research station was established on Makogai Island, in the Lomaiviti Group. Other land-based holding systems for aquarium fish, corals and coralline algae (live rock), were in operation for transhipment to overseas destinations. - The substitution of imports of fish and fishery product. Culture techniques of giant clams are well known but management of stocking and restocking programmes as well as marketing analyses require better knowledge. Giant clams produced at the Fisheries Division aquaculture facility at Makogai Island are sold to the ornamental aquarium trade. Species cultivated include Tridacna derasa, T. gigas, T. maxima, T. squamosa and Hippopus hippopus. Seaweed: the cultivation is supported through the usual extension services of the Fisheries department but the marketing has been picked up by a government statutory body responsible for marketing agricultural products. Fiji would like to see that once the seaweed culture is well established over the majority of the islands, government to come out and consider developing another simlar commodity. Since its introduction in the 1950s, tilapia has been widely accepted in Fiji as a result of efforts by Fisheries Division to improve stock management. The chitrilada variety of O. niloticus was identified as the most suitable variety for culture. Commercial production of tilapia has been established with 16 commercial farms and one industrial farm. Four private hatcheries as well as two government hatcheries provide fry for stocking ponds. Production in 2001 was estimated at more than 300 tonnes. 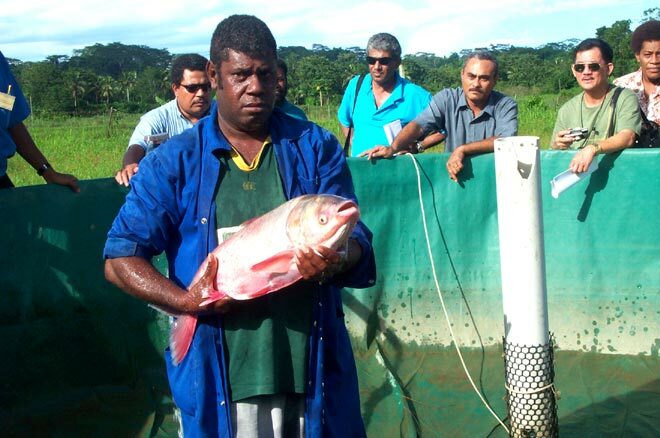 Tilapia farming as a subsistence fisheries has provided food security and better nutrition, particularly for inland rural communities.Fiji would consider tilapia as an export commodity. The marine prawn (Penaeus spp.) industry was began in the 1970s by the Fiji government and French entrepreneurs with varied success. 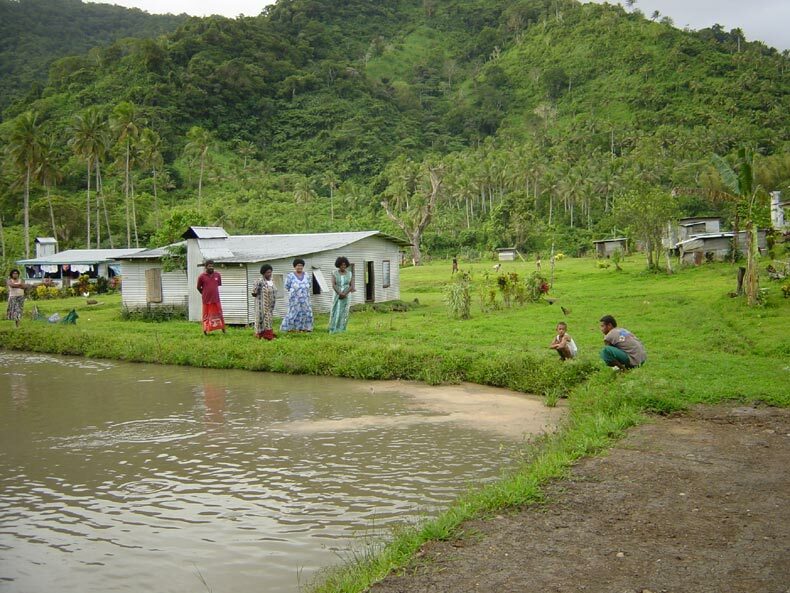 A private sector hatchery was established to provide post-larvae to stock thier own ponds while a Fisheries Division hatchery at Galoa was producing post-larvae for the industry and for export to Solomon Islands. Constraints are a lack of local availability of good feed compounds and intermittent supply of post-larvae to farmers. Demand for prawns in Fiji is high, from tourist hotels. The demand from tourist hotels is 200 tonnes annually. Domestic demand of around 600 tonnes is not satisfied by local production of around 400 tonnes. This commodity also has potential for export to New Zealand and Australia. Pearl oyster farming in Fiji is considered a fledgling industry with only one commercial farm and a government demonstration farm in Vanua Levu. While the department of Fisheries initiated the farming and current interest to culture pearl in the country, it has slowly devolved most the activities including hatchery, its farm, seeding house etc to the private sector and would latter carry out the research for policy proposal etc. Grass Carp (Ctenopharyngodon idella) was introduced from Asia in the 1970 for biological control of the aquatic weed, water hyacynth. Considered a success, it has become established in river systems. Polyculture trials with freshwater shrimp M. rosenbergii are being carried out. Species including milkfish, other seaweeds, freshwater shrimp, sponges, corals, reef finfish, sea cucumber, freshwater eels, spiny lobsters, trochus, mud crabs and pacific oyster are currently at research and development stage under four categories: biological, technological, legal and marketing.